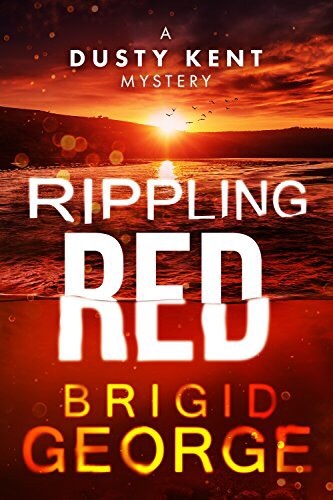 Rippling Red, by Brigid George, is the third book in the Dusty Kent Mystery series and follows investigative journalist Dusty Kent and her steadfast assistant Sean O’Kelly as they try to solve a cold case (well, two actually) in Australia’s Northern Territory. In Darwin at Sean’s insistence, Dusty has been asked to look into the apparent suicide of young Cody Bongiorno. His parents are convinced the teen was coerced, somehow, into taking his own life. Doubtful, but unwilling to disappoint the grieving parents, Dusty agrees to look into Cody’s death. In short order, Cody’s investigation links to another suspicious death: that of Jerry Lewis, allegedly taken by a crocodile. But when Jerry’s missing head is finally located with a bullet lodged inside and evidence points to Cody’s involvement in his death, Dusty and Sean have their hands full sorting out what really happened. This book paints a picture of life in the Northern Territory peopled with engaging characters and a host of possible suspects. The pacing of Rippling Red was steady, if not a tad slow, with a small handful of subplots vying for your attention. The dialogue was crisp and believable, with adorable episodes of local dialect tripping up our narrator, the Irishman Sean. The secondary characters (primarily the members of both Cody and Jerry’s families) were well rendered with unique personalities and backgrounds. All told, this was a highly enjoyable story and I look forward to Dusty and Sean’s next case. Wanna see red for yourself? Rippling Red is currently available in Kindle Unlimited HERE. Be sure to check it out.